Valentine's Day is just over 2 weeks away and whether you think it's the best day or the worse day, it is a day dedicated to love and I'm not going to go more into this day with the arguments people can come up with but regardless if you're in a relationship or free as a bird, there is always someone who could use a little extra love on this day. Today, I am going to share with you some ideas I have found and created myself over the years of being with James, either for Valentines, Christmas or even his birthday, and these gifts do not restrict you from making them for your other half, you can make them for a best friend, a family member and simply anyone you seriously care about and you want to express that. I have always thought of myself to be a creative person and I love to show that with making something personal, as well as buying a gift. If you're on a budget like me this year, why not challenge your creative mind and make one of these quirky personalised gifts for your loved one. This one I've done more than once, I actually use FreePrints Photobooks, it's an app that you can create your book as you like, with 20 pages to play with. All you do is pay for postage, which is around £6! Of course, I've only mentioned the basics but feel free to adapt and change, add and create what you like, it's all personalised, so there are no rules! Hi, what a fab idea with the deck of cards. My OH would love this, thanks for sharing. It was really fun to make! Glad you like it! Oh gosh damn it! I bought my boyfriend a little box from Not On The High Street for Christmas with cards where you write things you love about them on it but I so wish I hadn't because this would have been PERFECT for him - he's a professional magician so he would have loved this! Not On The High Street is such a great place to buy personalised gifts too! There's always birthdays and Christmas to do this him for! 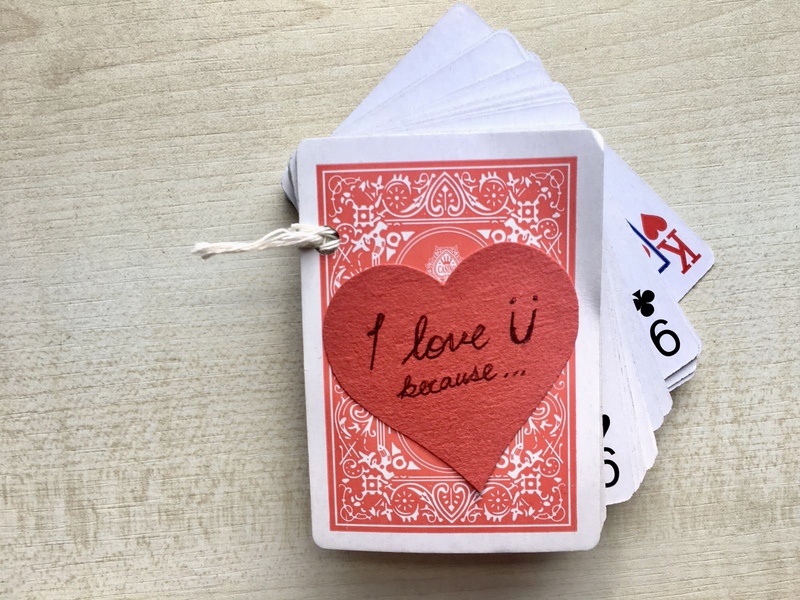 Love love the playing cards idea! I usually don't do much on Valentine's but I think I might just surprise my husband with these playing cards. Fan idea! That would be such a great surprise - do let me know if you make it! It's so cute and def budget friendly, but def from the heart! Exactly! I've made an given these for birthdays and Christmas present and heck why not for an any day gifts! It's definitely the best thing I've made! So personal! Aww that's so sweet, yes pls do! That'll be even more fun to make! Glad you like the ideas! So cute! I absolutely love personalised photo books, I made one for my boyfriend the Christmas and I made it my mission to pick the most embarrassing photo of both of us for the cover haha! 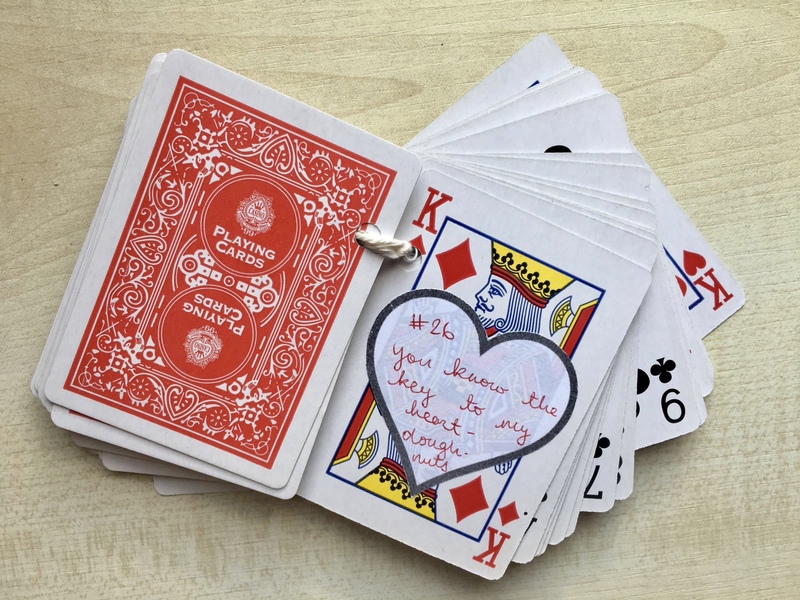 I absolutely love the deck of cards idea as well, it's a lovely way of recording memories as well as cute little compliments! You have definitely shown that you don't need to break the bank to make your other half feel special! I made one for my boyfriend *AT Christmas, apparently I can't type this evening!! Hahah embarrassing photos are the best, deft makes it more personal and exactly, no need to break the bank this Valentine's Day! Glad you liked it, it'd make the best personalised gift. We'd love to see your outcome! Ooh this is so cute! I love DIY gifts, I just find them so much more sentimental than stuff you buy from the shop. I'm single, but I'm thinking about making some of these treats for my gal pals as they're so lovely! I agree, there's always someone who could do with a little love! Those are the best presents right? That would such a great idea!